The sun shone brightly and everything was in perfect harmony with nature this morning when I awoke. Today I must leave my friends and return alone, for I must be home on Saturday, they on Sunday. They had made arrangements to visit Devil’s Bridge today and I to go to Ffestiniog or thereabouts. Before breakfast, we had a stroll in the garden behind the little cottage, where the old tenant was feeding his friends, the poultry, and tending the flowers and shrubs. Just a pretty old-world place it was, with redcurrant, gooseberries and creepers with roses all around. And the old chap told us to take our pick. After breakfast we had a chat, and at 10am I left them. The morning was glorious as I slid down the long hill to Bow Street, the wonderful scenic view being enhanced in the grand morning sunlight – a great garden of peace, beauty and contentment. It is good to be awheel on a day like this. On through pleasant surroundings I pedalled, at ease with everything. Talybont was passed, and near Taliesin I came across a CTC-ite on tour, lounging easily against a grassy bank. Beyond this village under a young forest I followed his example for half an hour. I thought of making a ‘pilgrimage’ to Bedd Taliesin, the supposed grave of that famous half mythical Welsh Bard. The bad road coupled with a lot of climbing, and my indisposition, put a damper on it, however, and so I proceeded along a beautiful, wooded road through Ysgubor-y-Coed. The entrance to Llyfnant Valley looked alluring, but I pushed on, determinedly to Derwenlas and Machynlleth. The Eagle’s Hotel laid me a four course dinner which was used to fortify the inner man against the afternoon’s hard climb, for the contours showed two formidable looking ‘humps’ of 940ft and 680ft respectively. Thus refreshed, I started again. The road starts climbing almost immediately amongst a pretty assortment of ferns. The Corris narrow gauge railway runs alongside the road and a snorting, puffing little engine, going to the quarries, amused me and set me a nice pace. The gradient, one in sixteen, was quite rideable but the length, six miles made it rather warm. Through Llyn Gwem and Esgaar Geilog to Corris I climbed. Near Corris the quarries had absolutely spoiled the scenery, and huge banks of shale accompanied me for two miles to Upper Corris. A little further on I reached the head of Corris Pass. The scene is indescribable. Right across, the huge flanks of Cader Idris formed a massive line of cliffs stretching up in an azure sky to the summit, 2,927ft. Cataracts and waterfalls leapt over the lower crags, flashing in the sunlight. A little to the left, Tal-y-Llyn lake appeared in a half wooded, half rocky valley. A few buildings dotted about and a winding road completed a really fine picture. Of course I stopped awhile to take in the scene, and it was only the discovery of an invading horde of ants that transferred me quickly to the saddle. 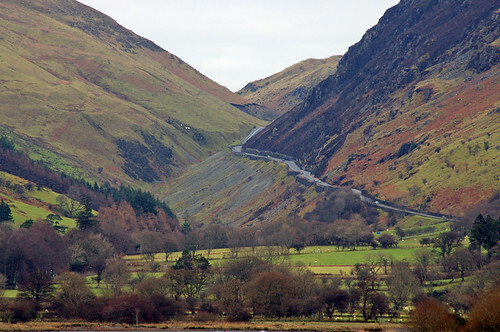 Now I pedalled down a steep gradient for two miles to Minffordd, then started to climb again into theTal-y-Llyn Pass. The hot sun beat mercilessly down on my bare head, and I was fain to doff my coat and sweater and cool my head under a waterfall. For ten minutes I felt the coolest in the world, and as an aftermath I had a half hour’s doze beneath a low cliff. Taking the road again, I walked up through the pass. A backward glance showed me a delightful view of Tal-y-Llyn, with the steep lower slopes of Cader Idris and Craig Goch. At last the road turned, and with gathering speed I fled downhill for four miles to Cross Foxes. The spin of a coin decided whether I should take the mountain road to Dinas Mawddwy or continue to Dolgellau. It was Dolgellau. Passing the Torrent Walk I entered the town, where a commercial hotel gave me a satisfactory repast. Some time later I emerged and took the Barmouth road. I reached Barmouth after a glorious run, and just caught my parents leaving the boarding house. As they could not put me up I started to look elsewhere but by an excellent stroke of luck I met a Bolton CTC-ite, with whom I have had many runs. We made it up to go to Dolgellau together for the night, so accordingly we sallied forth across the mile long railway viaduct. Just here I sustained my second puncture, but by pumping it up about twice I was able to manage. The same road to Penmaenpool as on Tuesday night was taken. Just beyond here we met two Sheffield DA riders with whom we found a night’s doss at the same place where I had had my tea. Before we retired we had a long chat on various topics, and two old men, comrades on holiday, joined in with a glowing account of a day over ‘Precipice Walk’. We retired at 10pm, I being rather tired due to the daytime heat.